Improve your community and society by training people to do all this! Sounds good... what's the evidence? 79% of people practicing Dru Yoga who returned questionnaires experience higher levels of serenity. 82 % of participants notice an improvement in their strength and stamina. What kind of people are experiencing these massive transformations in their lives? 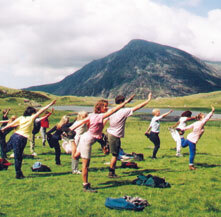 About 65% are students of Dru Yoga or Dru Meditation classes; 35% are Dru teachers. Amazingly, nearly 50% of these people say they practice Dru Yoga less than once every five days. Imagine gaining all these benefits from something you do only once a week or so! And then imagine how much you'd gain if you practiced some of these easy self-help approaches every few days. Dru Yoga - bringing you wellbeing with ease.